This webinar series has been designed to provide participants with a general level of knowledge about wetlands and wetland restoration options and considerations. Participants will come away from trainings with key knowledge, the ability to be more conversant about wetland issues, knowing what questions to ask when looking at restoration opportunities, and knowing when to contact or bring in an expert. This webinar series ties in with the Natural Resource Conservation Service’s (NRCS) nine-step planning process, focusing on Phase I collection and analysis steps: identify problems, determine objectives, inventory resources and analyze resource data. 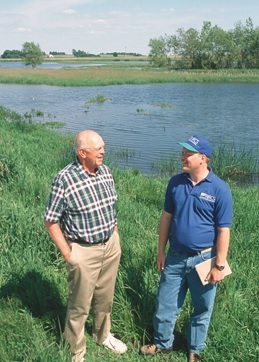 This webinar series has been developed to train Level 1and 2 NRCS Conservation Planners in field offices about key wetland concepts and restoration considerations as they work with clients on issues that involve wetlands. Additional targeted audiences include state and tribal wetland program staff, district staff, others working with NRCS Planners, staff from other agencies working on these issues (e.g. Forest Service, Bureau of Land Management), and NRCS non-planners who would benefit from this knowledge/skill-building. Participants to not require prior knowledge of or training on wetlands. This webinar series consists of nine individual webinars. While each webinar has been designed to be able to function as a stand-alone training resource, participants will get the most benefit from the webinars by watching them in sequential order, as each webinar builds off the prior webinars in terms of building a foundation of knowledge.